Karl-Heinz Rummenigge is not concerned by the prospect of Robert Lewandowski being Bayern Munich's only recognised out-and-out striker for the remainder of the season. Bayern sanctioned the sale of Sandro Wagner on Wednesday, just a year on from his arrival from Hoffenheim, after the Germany international received a lucrative offer from Chinese Super League side Tianjin Teda. With Bayern trailing leaders Borussia Dortmund by six points in the Bundesliga table, and still competing in the DFB-Pokal and Champions League, the decision to sell without drafting in a replacement came as a surprise to some. 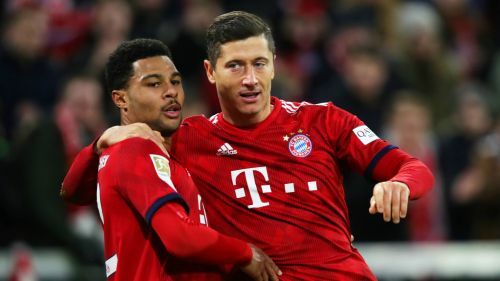 But Bayern chairman Rummenigge is confident the likes of Thomas Muller or Serge Gnabry could fill the void should something happen to Lewandowski. "Sandro asked [to leave] because he had an offer from China with an incredibly high salary," Rummenigge told reporters. "We discussed that with the coach and Niko Kovac thought that with Thomas Muller and Serge Gnabry, in case of doubt, we have alternatives. "But Robert Lewandowski has never been injured at Bayern Munich since 2014." Rummenigge also accepted Bayern face a tough task to hunt down a Dortmund side who have lost just once in the league this season. "Borussia Dortmund are playing a very good and very stable season," he added. "Catching them up there again will be very difficult, but we will work to keep the tension at the top alive."